IQS Directory provides useful search tools to find leading type K thermocouple manufacturers and suppliers. Utilize our listing to examine and sort top type K thermocouple manufacturers with previews of ads and detailed descriptions of each product. Any type K thermocouple company can design, engineer, and manufacture type K thermocouples to meet your companies specific qualifications. An easy connection to reach type K thermocouple companies through our fast request for quote form is provided on our website. The company information includes website links, company profile, locations, phone, product videos and product information. Customer reviews are available and product specific news articles. This source is right for you whether it's for a manufacturer of type K thermocouple alloys, flat type K thermocouples, and FDA type K thermocouples. TS is dedicated to providing you with the highest quality Type K thermocouples possible, in addition to rapid delivery at a competitive price. All of TC Corp’s products are 100% tested & checked by personnel for proper output, etc. Once TS Corp’s products pass complete inspection, they are given an engraved traceability number. Thermo Senesors doesn’t cut corners on quality— that’s a guarantee. We carry everything you need for temperature sensing in any industry, including chemical processing, food handling, water treatment, and a whole lot more. We believe in having everything our customers need right at our fingertips so you can get back to your job sooner! We carry a variety of type K thermocouples and much more! Visit us online to learn more! 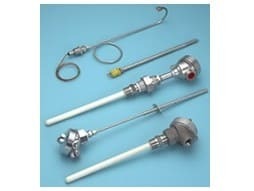 Turn to Thermocouple Technology, LLC for exceptional type K thermocouples. Our uncompromising products are ideal for numerous applications. Our thermocouples are unsurpassed and engineered with your industry in mind. Our fairly priced solutions are incredibly durable and can handle the most demanding conditions. Please give us a call to learn more about our type K thermocouples. Type K thermocouples are the most common and universal type of temperature sensors today. Used for their sensitivity and wide temperature range of -200ºC to 1,350ºC, type K thermocouples are considered general purpose devices because of their many uses in common, everyday applications. They usually have a high sensitivity, about 4/µv/cº. Type K exhibits high thermopower and good resistance to oxidation but remains inexpensive while lasting a long time. Type K thermocouples are used in all sorts of different heat and temperature applications, since they have good temperature precision and a wide measurement range. This kind of thermocouple is popular and available in a wide variety of probes. Since it has such a high temperature range, type K are especially used within the steel and iron fabrication industries. They measure the metal’s chemical composition and temperature during machining or casting to know when it has melted to a certain temperature and is ready to form. Other industrial applications, which use type K thermocouples’ temperature range, include kilns, ovens, plastic extrusion machines, pressure chambers, water tanks, heat exchangers and parts washers. Heated appliances like gas stoves also use type K thermocouples as heat sensors to keep from overheating, which is a safety concern and could cause damage. In the home, standard thermostats and temperature switches are also monitored by type K thermocouples because they are so inexpensive and easy to install. 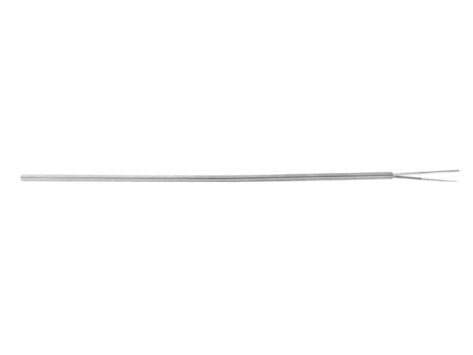 All type K thermocouples are made of a series of thin, bendable wire constructions. Each wire is made of either chromel, which is a chromium and nickel alloy, or alumel, which is an aluminum and nickel alloy. They are joined with digital devices for fast, easy readout and always use metal or ceramic protective tubes, especially when reducing atmospheres because type K perform poorly in this application. They are considered homebody thermocouples, as opposed to uppercrust, rarified and exotic. To differentiate between these different types, the wires are always labeled with a colored connector; type K are yellow. All thermocouple instruments are divided into temperature capacity categories. Type K, because they measure up to around 2000º C, are considered noble metal thermocouples. Because thermocouples are simple in design, fabrication and assembly processes are quick and inexpensive. The wires are all extruded, which involves heating a metal alloy preform billet and forcing it through successively smaller and smaller molds until the desired wire shape and size is accomplished. The wires are easily bendable, and can twist together without the application of heat or much force.